There are many ways to make a quick grill; but if have a tin can and no time for a fire pit, this is a quick way to satisfy your barbecue needs. 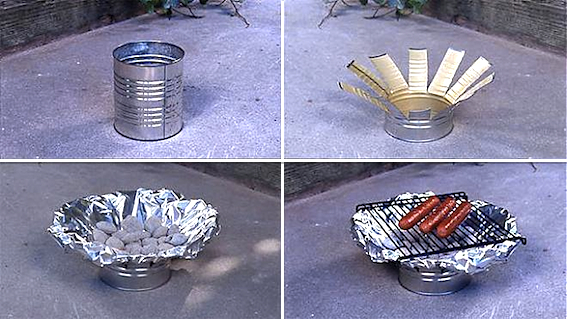 You'll need; a tin can, baking sheet (or small grill), aluminum foil and charcoal. Simply cut slats into the can and fold down to create a large opening and cover with aluminum foil to keep clean while burning. Tin cans come in a variety of sizes, so you can make your grill as large or small as necessary to fit your meat-grilling needs.